The Navy has announced that they will release not only a 30 year shipbuilding plan, but also a 30 year ship repair and modernization plan. I suspect the 20 year plan was stalled in the Department. It is really important to build an understanding of future needs. It seems this was a part of the problem in getting a realistic shipbuilding budget. We should anticipate replacing all our ships when they reach 30 years of age. As that time approaches we can reevaluate and perhaps delay replacement if they are holding up well, and we will be heroes. We really have to tell the administration and the Congress what we need. To do that I would reiterate the need to periodically redo the Fleet Mix simulation and study. The last one was done about ten years ago and still assumed multiple crewing of the Bertholf Class NSCs and Offshore Patrol Cutters. (Crew Rotation Concept). This entry was posted in Budget, Shipbuilding by Chuck Hill. Bookmark the permalink. Maybe it could be made a Superfund site and the EPA could push money to get it cleaned up even faster. It’s a win-win-win: clean up toxins, re-grow capacity, put people to work (both through the remediation and long-term in the shipyard). I think we are off topic here. There are plenty of US shipyards ready to do the work the Coast Guard needs. 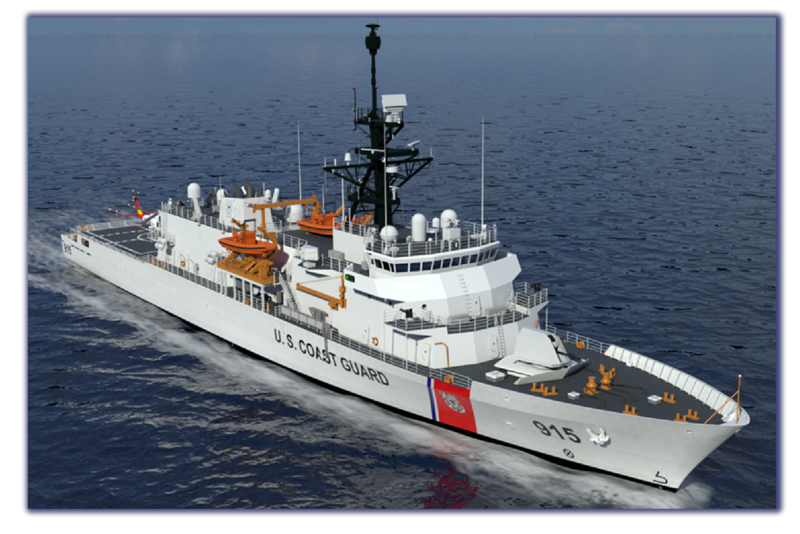 We are not having any trouble getting bidders for Coast Guard shipbuilding projects. And, the same system would be applicable to aviation and smaller Cutters / small boat programs. They will have varying lifespans and numbers of assets, but there are enough to do this in a planned, smart way. The only assets I see which do not fit this model would be the icebreakers. We need the plan to recognize and deal with the irregular pace of equipment replacement. Planning should allow recognition well in advance and help to determine what we will SLEP and what we will replace. And if the budget cannot be made flat we can at least build a consensus for dealing with the bumps. In addition to the normally 40+ large patrol cutters other major ships programs that have to fit into the plan include the buoy tenders, Mackinaw replacement, and of course the icebreakers. We need to average about two ships a year but sometimes that is going to be one icebreaker, other times three OPCs or four WLMs or perhaps a mix. We are going to have to start replacing the 87 foot WPBs relatively soon. The Air side is going to become significant in the not to distant future when we have to replace all the helicopters over a relatively short span. The $2B/year for what we used to call AC&I is realistic. We need to show why the recent budget increases are not just a one or two year anomaly. We need that kind of budget for the foreseeable future. i suspect the 87s like the 82s will be run into the ground before a replacement comes along. history tells us this. About not having enough shipyards. @secundius, that is why bringing heavy industry back to the US is so key. The US needs industrial capacity (steel mills, shipyards, automotive factories) and a skilled workforce. America has been funding the building of capacity in China (the obvious one, but other countries too), which, combined with their population, gives them the ability to stir trouble in all the West Pacific hotspots we have been talking about. Again, it’s capacity, not who is doing what… https://tradingeconomics.com/united-states/steel-production Go to this link and click the 10Y or MAX buttons, and you’ll see the US had 11-12 million tons per month production capacity in the past. The US now has about ~8 million tons per month. There is still the option of buying steel from reliable partners. It just cost more after tariffs.